Accountable care organizations take up only seven pages of the massive new health law yet have become one of the most talked about provisions. This latest model for delivering services offers doctors and hospitals financial incentives to provide good quality care to Medicare beneficiaries while keeping down costs. Exactly how ACOs would work in practice remains to be seen, though that hasn’t stopped the health care industry from embarking on a frenzied quest to create them as quickly as possible. Kaiser Health News is covering the formation and regulation of ACOs with an eye on health care’s future. Here’s a list of resources we have on the subject. This latest model for delivering services offers doctors and hospitals financial incentives to provide good quality care to Medicare beneficiaries while keeping down costs. 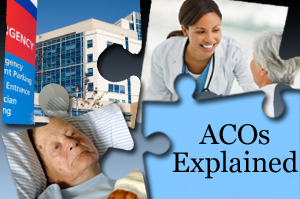 Here is a brief guide to what we know about ACOs so far. A new model of care encouraged by the health law  accountable care organizations  has set off a feeding frenzy among industry groups intent on getting a slice of the action, or protecting their own financial interests. BALTIMORE – Federal Trade Commission Chairman Jon Leibowitz told a meeting of 300 health industry representatives Tuesday his agency would explore an “expedited review process” for hospitals and doctors looking to determine if new partnerships they form to provide care would violate antitrust laws. For patients, an ACO could mean swifter referrals from primary doctors to specialists when needed, with less time spent tracking down test results. Those with chronic illnesses, such as asthma or heart disease, would be closely tracked, and those who are hospitalized would suffer fewer readmissions for preventable problems. The House bill calls for a three-to-five year Medicare pilot project to see if ACOs-which don’t exist yet–can lower costs and improve care. Each ACO would be operated by a group of doctors and hospitals which would be paid by Medicare to care for all the health needs of at least 5,000 elderly or disabled people. Come with me to the land of happy health reform. It is a place where Republicans and Democrats find common ground, a place where physicians, hospitals and health insurers sit together as partners, a place where criticism is respectful, not rancorous. It is the world of Accountable Care Organizations (ACOs).